At Garage World Townsville, we specialise in looking after the whole job, starting with your council application, slab, construction, etc. right through to final inspection stage. We take pride in ensuring you are looked after throughout your whole project. We can supply kit only buildings if required. Garage World does many projects both in and around Townsville for many residential, rural and commercial clients. You will not only be purchasing a shed but rather a Garage World experience. Receive the strongest and best Value for money shed in the market. We custom build to suit your needs for all types of jobs including factories, domestic sheds, and also patios, lined or unlined. Garage World Townsville is independently owned and operated under license by Wilsarose Trading Pty Ltd, ABN: 64 105 673 452. When you work with Garage World Townsville you are dealing with professional builders and qualified tradespeople who know what they're doing. Our reputation is built upon offering a versatile, affordable range of quality steel structures with superior design, independent engineering and exclusive systems including our patented Morinda Bracket systems. Quality and affordability has always been the core of Garage World.You want to invest your money in an asset that will last and we want to build you a structure that we can both be proud of. 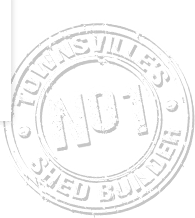 Garage World Townsville build much more than just sheds.We have the systems and experience to tailor any building or steel frame structure to suit your exact purpose, colour requirements and space. From small home patios to rural barns, industrial workshops and everything in between, no job is too big or too small for Garage World.